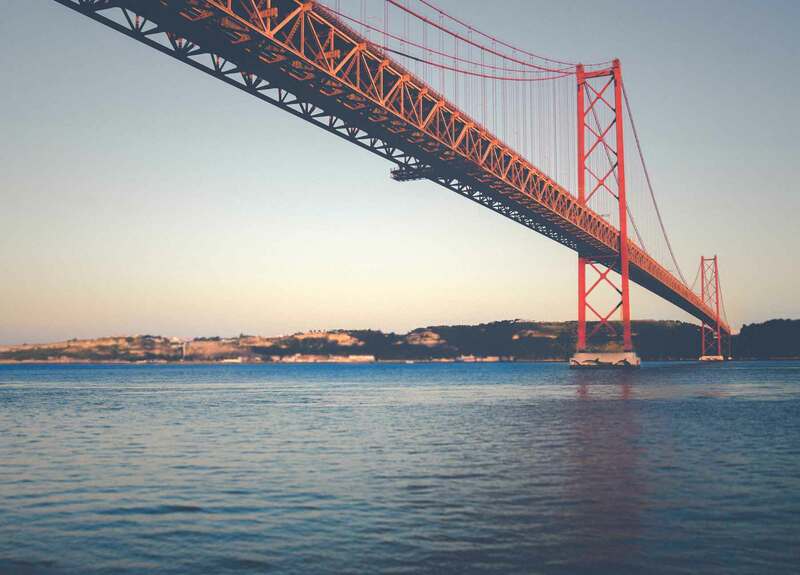 Lisbon is known as the city of the seven hills: A cidade das sete colinas. The Romans named Lisbon as Olissipo for its resemblance to the city of Rome which was also built over seven hills. 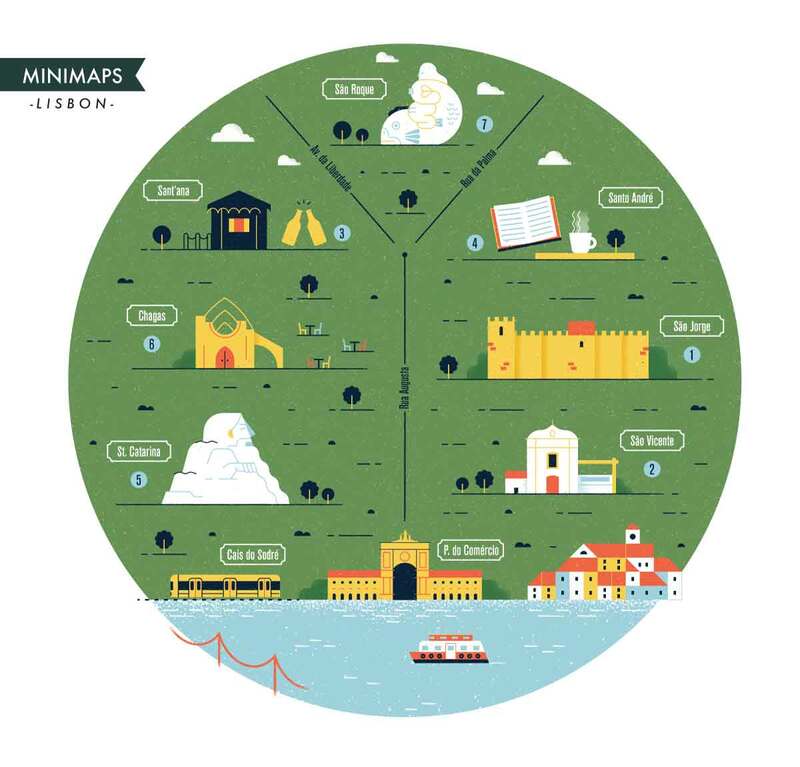 Some say it’s a myth, and that Lisbon actually has eight hills but no matter if they are seven or eight, the truth is that Lisbon’s hills add to all its beauty. 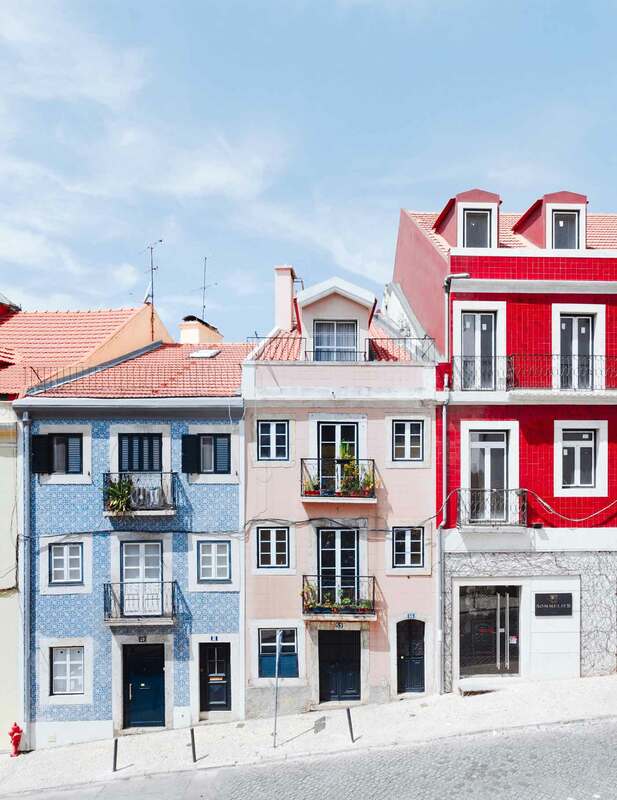 Built on the margins of the Tagus river – Rio Tejo – Lisbon is filled with color and tradition worth of contemplation. Throughout the city you can find several viewpoints and from each of them a unique view over it. 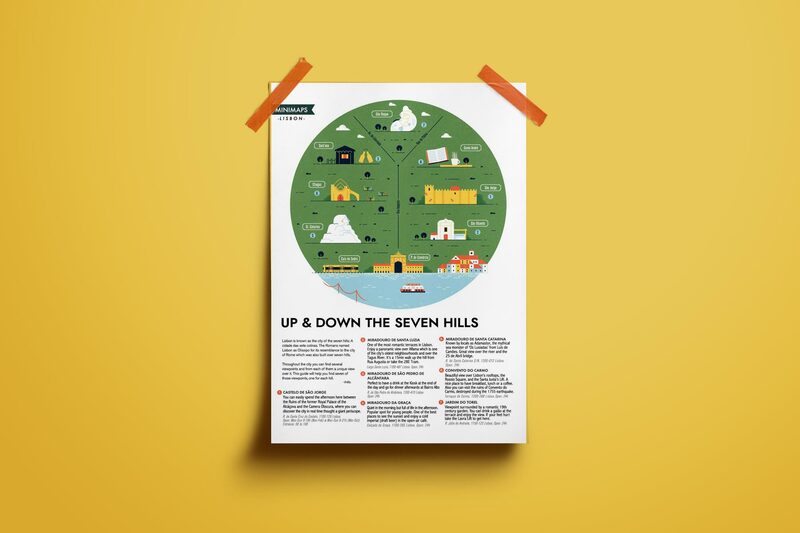 This guide will help you find seven of those viewpoints, one for each hill. Edited & Illustrated by Inês Costa. 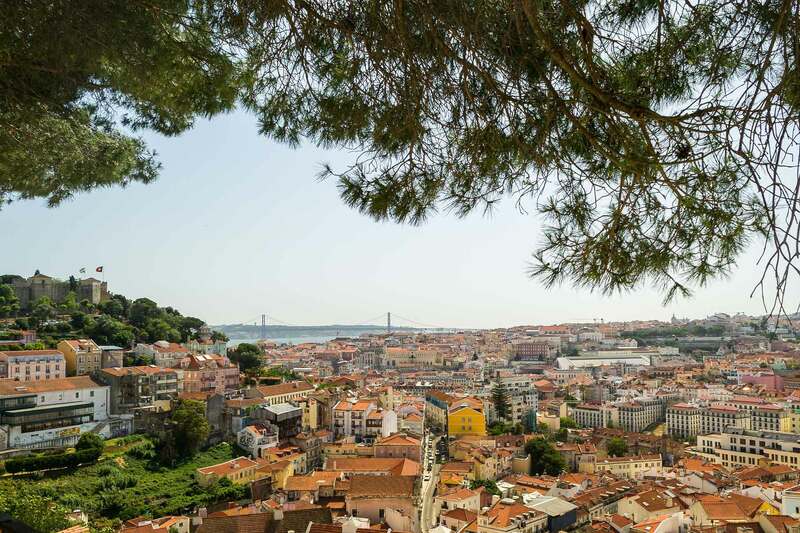 You can travel back in time at Lisbon’s tallest hill – São Jorge. 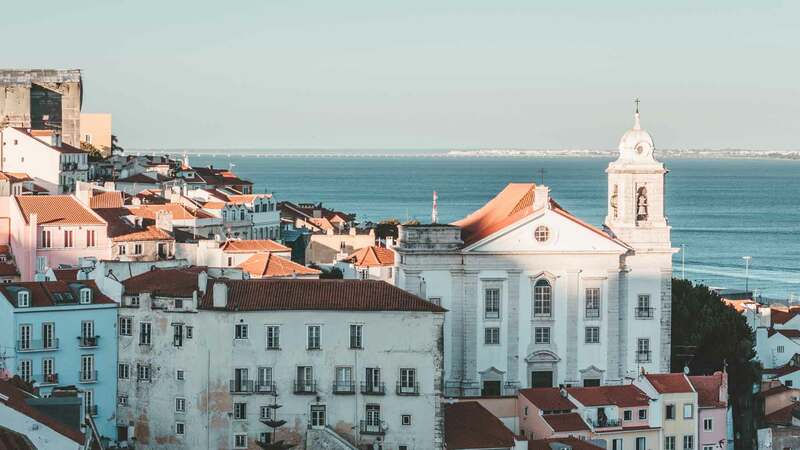 Surrounded by history, gardens and peacocks you can imagine a Lisbon from the past and enjoy a breathtaking view over the city at Castelo de São Jorge. 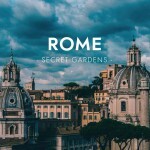 You can easily spend the afternoon here between the Ruins of the former Royal Palace of the Alcáçova and the Camera Obscura, where you can discover the city in real time thought a giant periscope. The main attraction, however, is still walking around the Castle and enjoying the view. This is the only viewpoint of this list that has a paid entrance. I goes from 5€ to 10€ but it is totally worth it. View from the Castelo de São Jorge. 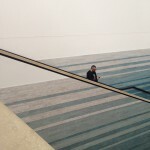 | Photo by Pedro Grão. In São Vicente’s hill you’ll find one of the most romantic terraces in Lisbon – Miradouro de Santa Luzia. You can enjoy a panoramic view over Alfama which is one of the city’s oldest neighbourhoods and over the Tagus River. Decorated with Azulejo tiles and colourful vines, you can either enjoy the shade by the tiled benches or the sun by the water mirror. Be sure not to miss the Azulejo panels on the side of the Church of Santa Luzia. To get here you can enjoy a 15min walk up the hill from Rua Augusta or take one of the historic tram routes with the 28E Tram. View from Santa Luzia. | Photo by Robin Alves via Unsplash. One of the largest viewpoints is the Miradouro de São Pedro de Alcântara. A geometric garden miradouro located in Bairro Alto, at the São Roque’s hill, that offers a panoramic view of Lisbon. Here you can see plenty of the city’s landmarks including the Castelo de São Jorge and the Tagus River. An Azulejo panel near its edge illustrates all the points of interest that are visible from here. 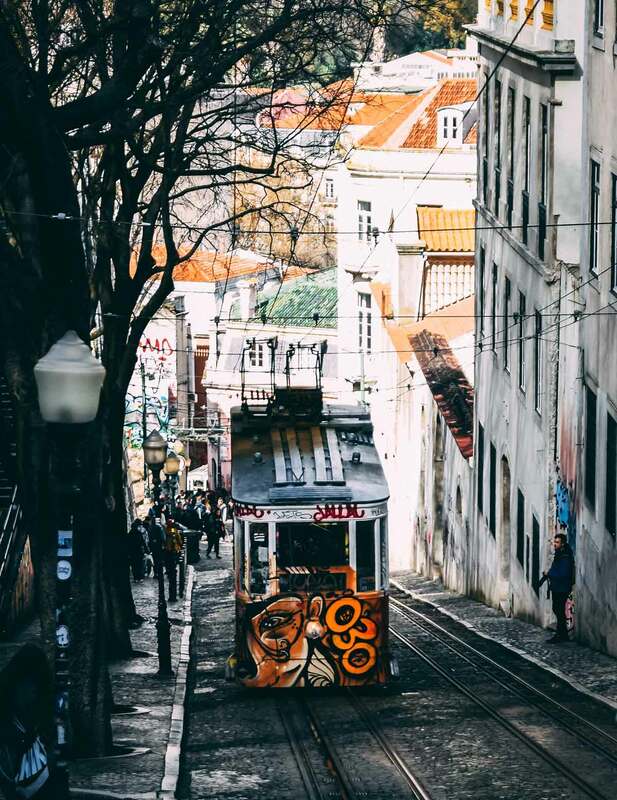 Next to the garden is the Elevador da Gloria, a funicular working since 1885. This is the perfect place to sit for a while and relax after a day walking through the city. You can have a drink at the Kiosk and go for dinner afterwards at Bairro Alto. Elevador da Gloria. | Photo by Daniele Salutari via Unsplash. Up Santo André’s hill is Miradouro da Graça. Although everybody calls it that way the official name is Miradouro Sophia de Mello Breyner Andresen, a poet who died in 2004 and spent many of her days admiring Lisbon from here. 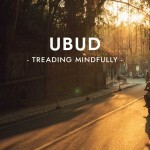 It is quiet in the morning but full of life in the afternoon, as it is a popular place for young groups to hangout. One of the best places to see the sunset and enjoy a cold imperial (draft beer) in the open-air café. View from Miradouro da Graça. | Photo by Nathália Segato. Miradouro de Santa Catarina, located at the hill with the same name, is known by locals by Adamastor, the mythical sea monster of Os Lusíadas from Luís de Camões. 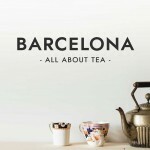 With a great view over the river and the 25 de Abril bridge, this place has a chilled and young yet busy atmosphere. Both tourists and locals enjoy the street musicians and performers. You can grab a coffee or a drink form the Kiosk or buy some snacks and a bottle of wine from the market nearby and enjoy the view. Ponte 25 de abril. | Photo by Glauco Zuccaccia via Unsplash. Terraços do Carmo are situated at Chagas’ Hill and hidden behind the ruins of Convento do Carmo. 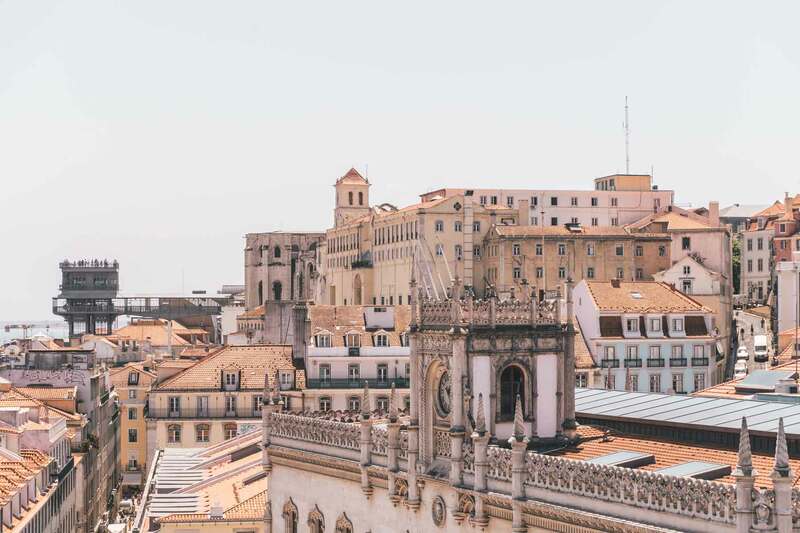 Here you can enjoy a beautiful view over Lisbon’s rooftops, the Rossio Square, and the Santa Justa’s Lift. A nice place to have breakfast, lunch or just to drink a coffee. You can visit the ruins of Convento do Carmo, destroyed during the 1755 earthquake, and see the Convento’s structure under the open sky. It is very easy to get here from Largo do Carmo or with the Santa Justa’s Lift. Here you can also find less crowded entrance to the Santa Justa’s Lift viewpoint. Elevator of Santa Justa and Convento do Carmo. | Photo by Fulvio Ambrosanio via Unsplash. At the top of one of Lisbon’s seven hills – Sant’Ana – there is a viewpoint surrounded by a romantic 19th century garden originated from an early 18th century farm called Jardim do Torel. Surrounded by a large green area and 18th and 19th century palaces you can drink a galão at the terrace and enjoy the view. 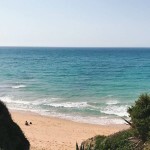 During the month of August the 18th century mermaid fountain gives place to a pool – praia do Torel. If your feet hurt from waking around Lisbon you can take the Lavra Lift to get here. It is the city’s oldest funicular. 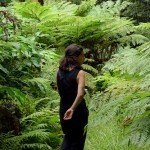 On the way to Jardim do Torel. | Photo by Hugo Sousa via Unsplash. 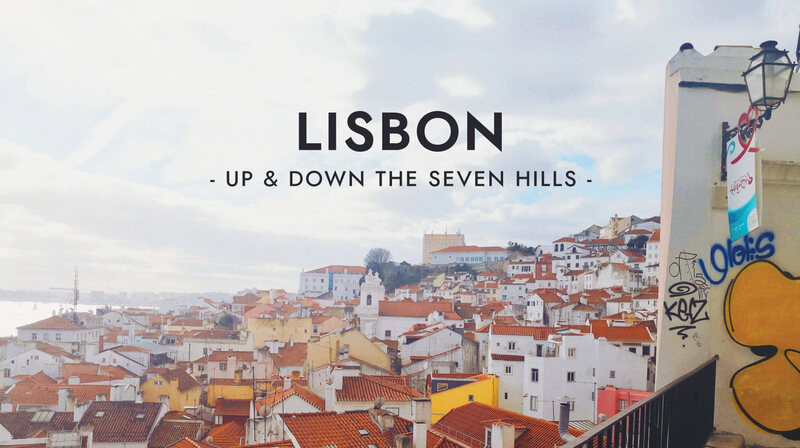 Ready to experience Lisbon’s seven hills? Download and print your minimap here.